Nexon M is the San Francisco division of Korea's largest mobile gaming company, NEXON. Nexon M's portfolio includes the hit games like DomiNations, Titanfall: Assault, and more. Nexon M was planning the global launch of Battlejack - the game it was publishing on behalf of the Finnish developer Grand Cru. During the initial phases of this several-month soft launch, Nexon M discovered an underperforming video conversion funnel, specifically in the CVR from click to install. Nexon M rushed production of several additional creative assets and reached out to ironSource, their trusted soft launch partner, for playable support. Over the course of the intervening month, Nexon M made several other attempts at compelling videos and made incremental improvement of about 35% CVR. 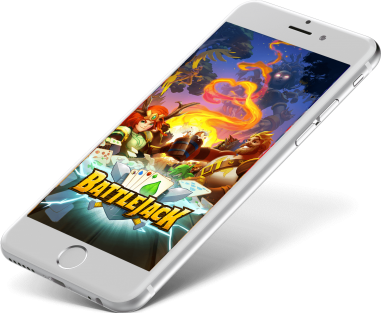 Finally, ironSource, together with Nexon M's own creative team, discovered why the video assets were underperforming and created a true-to-life playable for Battlejack, which was a fair representation of the game itself. The gameplay style was card battling with a hero collection, mixed with a blackjack system for the damage rolls. It was an RPG with several innovative twists that received a warm reaction from critics. Ultimately, at the time of the worldwide launch, this high-performing asset allowed Nexon M to gain an advantage of about a 50% increase in IPM, resulting in ironSource becoming one of the top sources for the launch. ironSource took the #1 spot for install volume, the lowest CPI by 8% from average CPI in the US market, and the ROAS competitive with major social networks. Pre-launching an app in select markets to test for monetization, bugs, etc. The percentage of users who saw an app-install ad and downloaded the advertised app. Ad unit with a snippet of interactive gameplay, letting users try out the advertised app. The number of app installs per thousand ad impressions. Pricing model, in which app advertisers pay each time a user installs their app from their ad. Metric used to calculate the efficiency and performance of digital ad spend.